All-star closer Heath Bell and the splurging Miami Marlins have finalized a three-year, $27-million US contract, a day after the team reached a preliminary agreement with shortstop Jose Reyes. 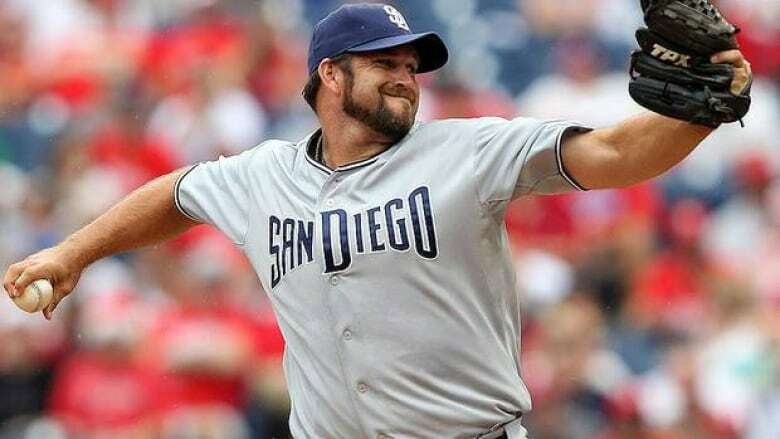 It might take Heath Bell a little while to get used to his new surroundings. After finalizing his $27 million US, three-year contract with the splurging Miami Marlins on Monday, the all-star closer sat alongside general manager Larry Beinfest at a winter meetings news conference as owner Jeffrey Loria watched from the second row. "I think this is a great time for Miami because you've got a new team as the Miami Marlins," Bell said. "We're going to be in Miami, the city of Miami, right?" "I'm not sure if it was a county," Bell said. Along with a new name, new uniform colours and downtown retractable-roof ballpark that opens on April 4, the former Florida Marlins will have a new-look roster. They team reached a preliminary agreement Sunday on a $106 million, six-year deal with all-star shortstop Jose Reyes and also have courted Albert Pujols, C.J. Wilson and Mark Buehrle. "I think it's going to be pretty fun to play with Jose again," said Bell, a teammate with Reyes on the Mets from 2004-06. "He's a tremendous shortstop, great guy. If Hanley [Ramirez] moves over to third base and Reyes is at shortstop, basically I could let every ball [get] hit to that side, and they'll pretty much field it, clean it and throw it to first." Bell had more than 40 saves each of the past three seasons for the San Diego Padres, including 43 in 48 chances this year with a 2.44 ERA. Leo Nunez, who had 36 saves this year, is on the restricted list after he admitted to playing under an assumed name. "The closer formerly known as Leo Nunez obviously did a great job for us. There is still a tremendous amount of uncertainty surrounding his situation. He's now known as J.C. Oviedo," Beinfest said. "Our intentions as of today are to tender him and work through the process with immigration, and we will go from there." Florida had an opening-day of $56.9 million this year, when the Marlins drew a major league-low 1.52 million fans to Sun Life Stadium, also home to the NFL's Miami Dolphins. Loria expected his team will draw 2.5 million to three million at the new ballpark. "We've been waiting a long time. I think our revenue struggles have been well documented playing in a football stadium," Beinfest said. "What we're able to do now is we're able to look in areas that we haven't been able to look into in the past, an all-star free agent closer, for example, and we're going to enjoy the revenues in the new ballpark that we haven't been able to in our current situation. It's a little different time for us."